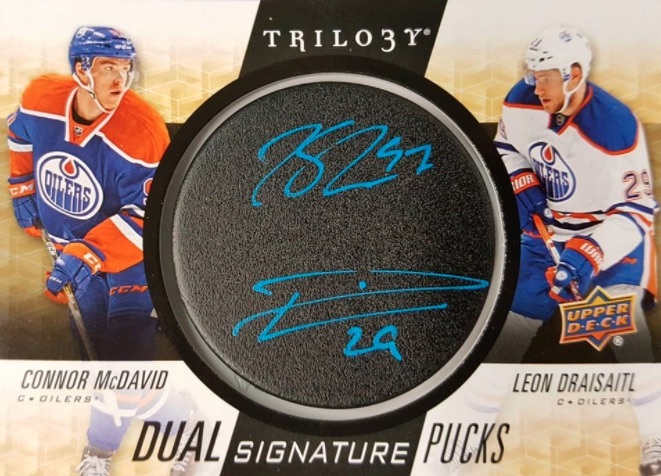 Returning for another collecting season, 2016-17 Upper Deck Trilogy Hockey maintains a legacy of hit variety plus sets that come in groups of three. The 50-card base set includes Blue Rainbow Foil, career-specific Green Rainbow Foil Jersey Relics (#'d), and season-specific Black Rainbow Premium Materials (#'d). 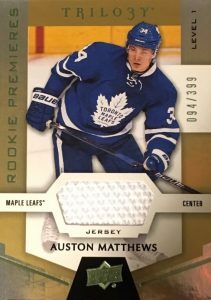 Adding to the main 2016-17 Upper Deck Trilogy Hockey set, the Rookie Premieres subset is the primary draw for many collectors and these 33 rookie cards are issued in several versions. Common Rookies are numbered to 999 while Uncommon Autograph Rookies are limited to 375 and Rare Inscribed Autograph Rookies total just 49 copies. There are also Blue (#/499 or less) and Black (#/99 or less) parallels for each. 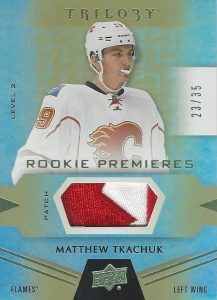 Another Rookie Premieres edition takes a memorabilia approach with Common Rookies Jersey (#/699), Uncommon Rookies Patch (#/35) and Rare Rookies Tag (#/5). 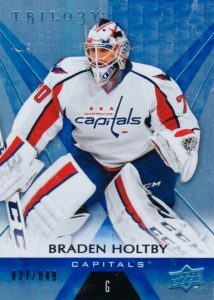 In addition, 2016-17 Upper Deck Trilogy Hockey offers multiple inserts that should be familiar to collectors. 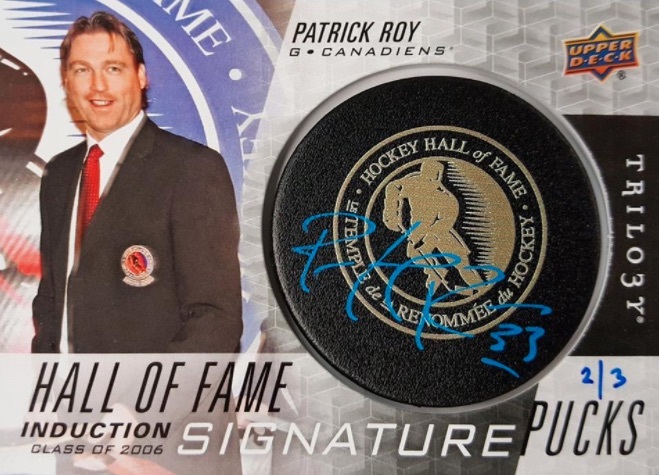 Signature Pucks (1:16 packs) and Hall of Fame Signature Pucks (1:432 packs) showcase a distinct look that is mirrored by the multi-player Dual Signature Pucks (1:432 packs). Alternate puck logos add a limited chase with Team Logo (hand #/17 or less), and NHL Shield Logo (hand #/3 or less) parallels. 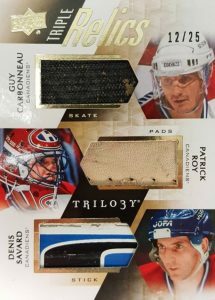 Tryptichs is back with considerable relic variety, including blocker, jersey, glove, leg pad, patch, skates, sticks, and strap. There are also signed versions. 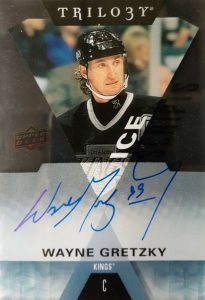 Another hobby favorite is the Ice Scripts insert which features on-card signatures done on plexiglass. Other choices in 2016-17 Upper Deck Trilogy Hockey play on the three-themed brand. Triple Relics are exactly as they sound with a trio of swatches for players from the past, present and future of the sport. 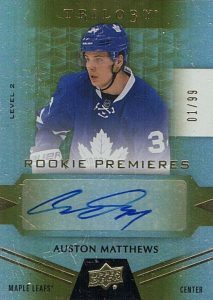 Triple Rookie Autographs (#/25) feature three top names from the '16-17 rookie class on one card with Blue (#/5) and Black (1/1) parallels. 2016 17 UD Trilogy CHRISTIAN DVORAK Rookie Premieres Auto Level 3 49 "Go Yotes"
2016-17 Trilogy rookie premieres auto level 2 Olivier Bjorkstrand 239 275!!! 50 cards. Shop for complete base sets on eBay. RAINBOW FOIL PARALLEL CARDS: Blue Base #/849, Green Career Stat Relics #/629 or less, Black Season Stats Prime Relics #/86 or less, Printing Plates Base #/4. 33 cards. Serial Numbered #/999. PARALLEL CARDS: Green Jersey Relic #/399 (No card #69), Black Base #/99. PARALLEL CARDS: Black Auto #/156 or less, Green Patch (not signed) #/35 (No card #102). All subjects not included in Black parallel. View specific options with the full spreadsheet. PARALLEL CARDS: Green Tag (not signed) #/5 (No card #135,150), Black Auto #/3 (*Card #150 - 1/1). 14 cards. Overall Odds 1:80 packs. 46 cards. Overall odds 1:16 packs. Specific group odds noted below. *Cards found only in parallels noted below. 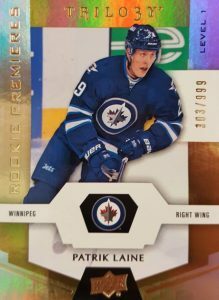 PARALLEL CARDS: Team Logo #/17, NHL Shield Logo #/3 (*No card #JM). 14 cards. Overall Odds 1:432 packs. Specific group odds noted below. PARALLEL CARDS: Team Logo #/10, HOF Logo #/3. 7 cards. Overall Odds 1:432 packs. Specific group odds noted below. 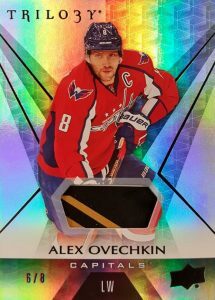 PARALLEL CARDS: Team Logo #/5 (*No card #AL), NHL Shield Logo 1/1 (*No cards #AL, SN). 81 cards. Autographs or relics noted below. I would like to thank UD for not including any Canucks’ rookies in this product. You have saved my wallet from any pain. Anyone thinking of joining a break to try and hit a Canuck (unless you want a Sedin base), better to go to a casino, your money will be so better spent. From a quick scan, teams with no rookies in this product: Anaheim, Colorado, Dallas, Florida, Los Angeles, Minnesota, Nashville, Pittsburgh, St. Louis, San Jose, Vancouver, and Washington. Yes more than one third of the NHL teams do not have a rookie. Get ready to be skunked big time in team random breaks if you have my luck. Best to wait till spX or whatever product with rookie updates to buy boxes or join breaks. I totally understand why people are complaining about this product: the scarcity of the number of teams in the rookie set makes it unappealing for some of them. Of course, the random teams box breaks may become a total loss of money. Vancouver and Ottawa are only two examples out of many. BUT, at the same time, this is a product with very few sets and number of Rookies, which means the chances to hit a decent card are increased. 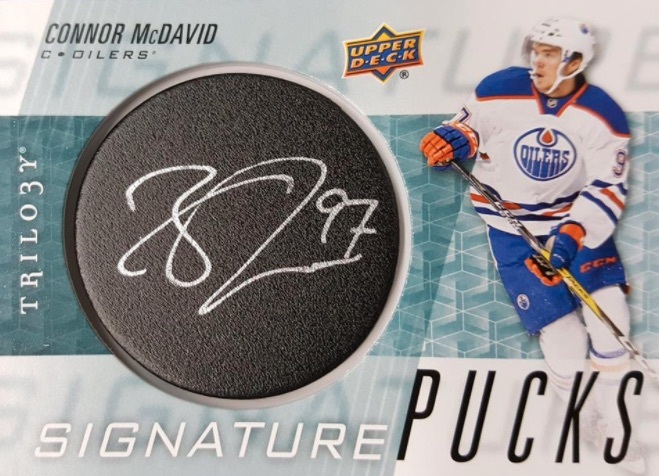 Besides the Base set and the Rookie set with its 3 levels, there are the Puck Signatures, Ice Scripts, and Triptychs (Materials and Materials/Auto). I’m not saying every box will have a High End Laine or Matthews or that every box will break even. But I think that the chances to pull a good signature or a good rookie are much better than with other products. Personally I like this kind of items, were the good rookies are concentrated and the number of sets is quite limited. Certainly, this is unfair for a Canucks fan, but a Maple Leafs fan will find this product quite worthy. I will wait for the grading of the product, after I open my cases, but this is one of my favorites. On the negative side, while I love its simplicity, I feel that there’s no innovative initiative here. I understand that the sets I named in the lines above are the trademark of the collection, and I don’t complain about that. Every product needs something to be recognized by, but I would also have expected something new. And I forgot…It seems that finally they listen to the many complaints regarding the golden markers used for the signatures on pucks. Many of them were barely noticeable. This year, from what I can see in the pictures, they used a light-blue colour which is much more visible. Very impressed by the quality of this set and the great potential it offers. Will buy a case and see what I get !! Time to get rid of sets like these. Too much of the same and in the end it means nothing. I think its time for us to all have a voice here and get Upper Deck to get in gear. Upper Deck, O-Pee-Chee I understand. Parkhurst looks pretty good but we are missing a lot of cards from a lot of players and these should be seen as a chance to celbrate hockey not just make money. If its a good product you will make money. Product should be revamped or removed. They improved the puck signatures, but the rest is tired. UD doesn’t really seem to be trying to do anything but maintain margin these days. Have posted here a few times – have lost all interest in this hobby in very short order. Seriously, you all need to give your heads a shake, or better yet, discuss the “modern” hockey card hobby with someone who has no clue about it. You will quickly find you’re all dupes (me included there for a while). Upper deck is a ponzi scheme. It’s business model is based on fairy dust hence I suspect the rumblings of the sketchy financial situation the company is in. Upper deck is a private company – ever wonder why no major company involved in the hobby world or, perhaps, a big entertainment conglomerate have not bought upper deck yet? Seems kinda weird yeah? The money is in selling your private company and cashing out. How come the guys at upper deck haven’t done that yet? I suspect it’s because potential buyers recognize its simply smoke and mirrors with no real value. And borderline criminal. Anyway I hope many of you finally realize the modern hockey card hobby, with only 1 provider (a monopoly I think……), is a lose lose lose proposition. I can seriously see some people getting into major trouble in terms of addiction and debt buying this stuff. It is 100% no different than gambling except you’re playing at the high roller table ($150-$900 / box) without even realising it. Would any of you play blackjack at the $500 min table? I suspect not many. But you’re happy to do that with hockey cards? Sure you can sell your cards on ebay. But do get ready for tons of non paying, degenerate buyers. That’s a whole different story……. The cards look nice, but buying packs and boxes is pointless, you will lose money on most cases unless you get a really good hit. And why do we get up to 4 base cards (numbered) as hits in a box? What a waste. Some boxes don’t even have an auto Rookie card. The last two years in Trilogy and SP Authentic (the only two I generally collect) have been a total waste of money. I’m pissed off with Upper Deck for the lack of value/return in boxes – I’m buying no more. 3 stars for me. A nice and simple collection, with few subsets. With a case you can built almost the entire rookie collection and you also have a few extras. The design is nice, no damaged cards. The puck signatures is always a beautiful set, especially when we get to see the actual autos. Ice scripts is one of my favourites, although I would love to see amore realistic ice design, with scratches and everything. On the other hand, the high serial numbers make the blue base parallels a bit futile. Same thing could be said about the rookie first class. They should have eliminated at least one class. As for the profitability, I didn’t make my money because I didn’t have any major hit, but this is how the hobby works. I’m not mad, since for me Trilogy is a very nice set and you cannot always win. All in all, a decent product. collecting. let’s hear about the good pulls from you guys out there. I don’t like being called dumb. I like the rush when I get the big hit — some people play the slots others play the horses and some gamble on football games. Well said Damone. Agree 100% with you buddy. Can be very kind or very very bad – especially if you land the wrong teams in a group break. I have had both sides of the stick on this. On the one hand, I have randomed Toronto a few times and at least 2 decent Leaf cards come out of a case. I also landed Minny and Tampa (same break). I got nothing and referred to this checklist. 7 total cards featuring those teams (not including parallels)! I think 1 for Minny. If you are breaking this yourself, there are many nice rookies to be had! If you decide on a group random, oh man – feast or famine. Recommend for rookie, base set, and blue parallel (/849) as the set is relatively small and the /849 cards are plentiful and nice looking. For team collectors, quite a few are hardly represented. No value at all in the product. It’s like liting your money on fire. UD should be ashamed! Despite the lack of hard autos in the base set, I do love this product. 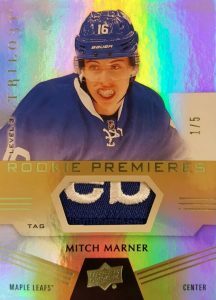 The foil cards are always an eye-catcher and the rookie crop this year has been fantastic. I’ve been chasing down the hard to get Level 3 autos and the cool patch parallels too. It’s been fun and my set to collect this year. Thanks Upper Deck! This product should be no more than $100 CDN per box, that is my main argument for 3 stars but it is a nice product especially if you love the Leafs (I don’t) as 90% of boxes I have seen broken will contain at least one Leaf hit. I totally agree with above posts that getting in on team random group breaks can be a complete bust (more than likely) – I have been on both ends of the spectrum, landing Toronto twice at $55 for a double up (a big pile of Nylander’s #’d as low as 8, Gilmour HOF sig puck but zero Matthews’) and getting Minnesota, Vancouver, etc in others. If you can find a box at a decent price, I recommend giving it a go but my overall rating is this product is, at the moment, overpriced and (I know, Hippocritical) avoid team random group breaks!